Last November, I wrote a post about a very special commission I’d received to paint the extinct Carolina parakeet, the only psittacine that was native to North America. I’d planned to write more posts about the project as it went along, but decided that I needed to concentrate on the numerous steps it took to get to the finished work you see above. 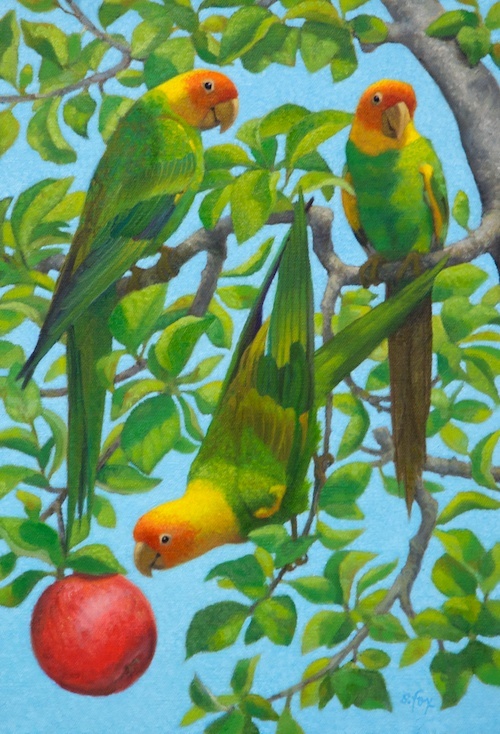 “Precarious” is for a new book on parrots that has been written by a retired University of California professor. She had found that there were very few images available and wanted a new one. Her brief to me, which informed my concept for the painting and the direction my research took me, was to “show what has been lost”. The majority of paintings of these wonderful little parrots that I was able to find show them in bald cypress swamps which were, in fact, one their habitats. But what intrigued me was finding out that their range stretched from Florida to southern Ohio and from the east coast to what is now Missouri. So that gave me a large area to choose from. I also learned that large flocks would come zooming into apple and peach orchards and that they were considered a pest at times. I decided to place my birds in the Ohio River Valley and to put them in an apple orchard. Further research showed that Rome Beauty apples originated in Ohio before 1851, so that is the apple I chose to portray. Imagine, then, that you were a farmer’s wife in 1870s Ohio and had a little time between chores to get a cup of coffee, sit at your kitchen table and look out over your apple orchard. Suddenly, a flock of 500 or more rollicking, chattering, colorful Carolina parakeets come wheeling in, landing in your trees. What a sight that would have been. And that’s what’s been lost. Forever. The finished painting will now be digitally scanned for use in the book. The original will be returned to me. Stay tuned because plans for forming for celebrating the publication of the book that involve “Precarious”. The publication date hasn’t been set yet, but I’ll let you know as soon as I do. At that point, I’ll post the story of the painting step-by-step. Your painting Precarious is really beautiful!